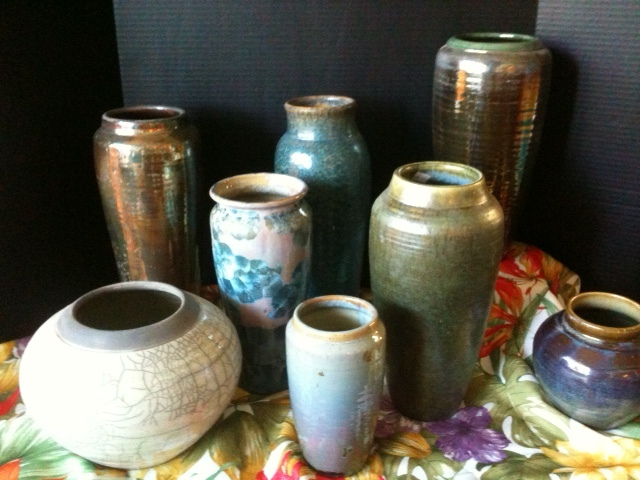 Just like a year ago, Jim Fox, from the Russian River area, appeared in his truck with a huge assortment of pottery vases to choose from. He told us that over the years, his clay work has evolved from the Raku process, to playing with glazes using metallic additives. The result is some very colorful vases of all shapes and sizes, influenced by being fired with zinc, copper, and nickel droplets. We also chose two lamp bases which will look extremely decorative in a home setting. This pottery makes wonderful gifts, and the vases lend themselves to the tropical flowers we carry at Island Home and Garden!